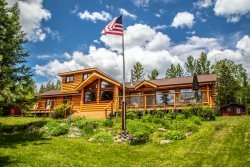 Opels Shoreside is a popular bright and sunny cabin located on Lake Superior. Close to the Lake plus great biking and walking road. Opels Shoreside Cabin is a two bedroom, one bathroom, one story Lake Superior cabin. Located on popular Croftville Road, just a couple of miles outside of Grand Marais. You will love the lake-facing deck to enjoy the Lake Superior Views. At Opels Shoreside Cabin you are just steps away from the private shoreline. The bright and cheerful living room greets you upon entering through the front door. The living room features a flat screen TV and gas fireplace. The room has large windows and plenty of places to sit back and relax. The large lake-facing sliding glass doors allow you to enjoy the Lake Superior views and provides plenty of natural light. The cabins two bedrooms each have a queen bed. The bedrooms provide plenty of room to unpack and truly enjoy your stay at Opels Shoreside. The kitchen is located at the end of the hallway, just passed the bedrooms. The kitchen has full sized appliances and the basics needed to prepare home cooked meals during your stay. Enjoy your meal at the dining table which looks out over Lake Superior. The one bathroom is at the end of the cabin. The bathroom has a walk-in shower. Let the views take your breath away on the lake-facing deck. Perfect for enjoying a cup of coffee while watching the sun rise. You can hear waves crashing against the shore line while you relax on the deck. The cabin also has a firepit right on the cliff`s edge overlooking Lake Superior. Or grab a seat on the bench to enjoy the views. Opels Shoreside has a private shoreline area for you to enjoy, with easy access down a flight of concrete stairs. Enjoy skipping rocks or just taking in the beautiful scenery. You can dip your toes into the cold Lake Superior waters on a hot summer`s day. The size of the beach depends on the season and the water level. The cabin is perched just above the breakwall. Views of Opels Shoreside from the lake. Views of Opels Shoreside from the lake. Views of Opels Shoreside from the lake. Views of Opels Shoreside from the lake. Views of Opels Shoreside from the lake. The cabin as you will see it when you first pull in. When you see this, you know you`ve arrived. Located on the popular Croftville Road, just beyond Grand Marais, this bright and sunny two bedroom, one bathroom, one story cabin is close to Grand Marais and on a great road for walking or biking. Satellite TV with VCR and DVD. All one level. Easy kayak access. Rates posted are for 1-2 people. There is an additional $5/person/night fee for each additional occupant over 2 yrs. old. Get an exact quote for your party by clicking the “Book with Cascade” or “Instant Quote” button then enter your total occupant number. When booking reservations please be sure to enter your additional guests. Additional guest fees cover increases in utility and cleaning costs, plus allow rates to directly reflect usage. This makes homes more affordable for smaller parties. Easy to work with and provided clear instructions. I loved it! Everything was exactly what I had hoped for and true to the information advertised. I also liked the little information notes found around the house. I found them to be reassureing and helpful. The location was amazing. You couldn't get any closer to the water. The house was clean and comfortable. The shower stall was small and tough to shower in. At 5'7" I couldn't even comfortably stand under the water. All in all, it was a great experience. Our experience with all the Cascade team has always been great. all the staff have been very responsive when we've called with any requests, and the maintenance people that have delivered supplies were very efficient and courteous. we really love Opel shoreside cabin. It's a wonderful location on Croftville road with great access to the lake. The cabin is comfortable and has nice amenities such as the Crock-Pot, waffle iron, and well-equipped kitchen. We like to cook in and it is a great place for that. The Opels obviously care about the comfort of their guess and do a great job of maintaining the cabin. The cabin was wonderful! Right on the lake, plenty of room and the kitchen is well stocked. Best location on Lake Superior. I found everyone I've spoken to over the years very professional and very friendly and helpful. Opel's Shoreside is a very homey and inviting cabin! One where you can sit and relax and enjoy the view out of the many windows! It is located on a rather quiet road and not on 61 where you would hear much traffic noise! I could spend the entire summer there! It's fun and educational to read all the material and look at all the pictures of the Santa Fe trail! The home is in a great location on the shore of Lake Superior. A very comfortable home with a wide variety of amenities. Very relaxing and well kept. The team is wonderful. This was the easiest property rental experience I have ever had. We loved the home, the location was amazing, private, and beautiful. The home is comfortable and exactly what we hoped it would be. Cascade Vacation Rental team members are courteous and knowledgeable. We've been renting Opels Shoreside once or twice a year for many years and always look forward to being there. The quaint location on Croftville Road is ideal. The cabin is right on the water's edge, with beautiful views, and has that wonderful deck where we spend many hours relaxing. The accommodations are great ... fully-equipped kitchen, internet, TV, comfortable beds, fire pit, grill, etc. We hope to return again and again for many years to come. It's the kind of cabin where good memories are built. I appreciated the north shore updates and info before our stay. Perfect Lake Superior view! The full moon gave us a spectacular show both nights, awesome light. It's always been good! Very cordial and very helpful! Opel's shoreside is a perfect! It's close to Grand Marais. It has a wonderful view of Lake Superior! The furniture and the beds are very comfortable! The kitchen is conveniently laid out with everything that's needed for cooking, etc. We loved everything about this cabin. Location right on Lake Superior with own beach was by far the neatest thing. Being close to town was great. The inside of the cabin was well done. I don't have one single negative thing to say and definitely look forward to coming back! We liked everything about our all too short visit. The decor of the home is very charming and cozy and it is equipped just like a real home. We might try for a summer visit next time to get better weather. This won't be the last time we stay at Opel's cabins. The experience at shoreside was wonderful. The waves of Lake superior sounded great. It was a great experience. We consider Opel's Shoreside an excellent value. Cabin in well-equipped and reasonably up-to-date. Having wi-fi in also an important advantage. I noticed that the owner replaced an older outdoor grill with a new Weber grill. That was very thoughtful. Biggest drawback is the size of the shower stall. A large person could have some serious difficulty using it. We have stayed at this cabin before and will likely return. The price point is very good. Beautiful location,deck right on the lake, super clean, cozy. Fourth visit to Opels and we will be back next summer. Great collection of good old fashion cabins along Croftville Rd. Our was well appointed and comfortable. Love the location near Grand Marais. We loved the cabin. Like a home away from home. One suggestion though. The shore side of the cabin could use a trimming of all the wild trees growing and spoiling the magnificent view of the lake. That view is one of the main reasons we come up there. This was our ninth time staying at Opel's Shore Side because we love staying there. The location is perfect. It's on a nice road for walking, it's close to Grand Marais, it's right on Lake Superior with a very nice deck. The interior is very comfortable - furniture, bed, T.V./DVD etc. Love the new red couch!! The kitchen is well appointed - we don't having a dish washer or a garbage disposal! It would be nice to have a light right above the stove, though. Opel Shoreside is perfection. Cozy, warm, all the conveniences, location, privacy and most of all the deck so close to the lake. It has everything I want in a Lake Superior rental. Just lovely, and my new favorite.